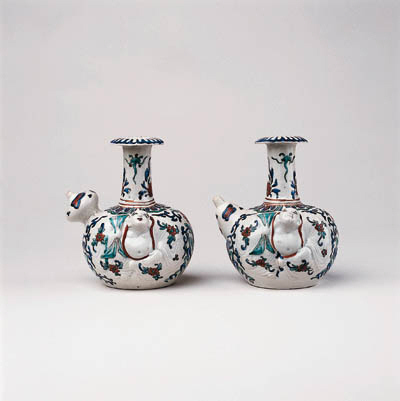 Volker mentions gorgelets in his survey The Japanese Porcelain Trade of the Dutch East India Company after 1683, p. 15. Malacca's Dagh register shows that on February 15th the Batavia junk Ongodjua arrived from Japan, with a cargo of a 100 bundles of porcelain cups, 50 of bowls, 100 of gorgelets and 200 of plates. The collections at Drayton House, Northamptonshire, were formed by Sir John Germain, an Anglo-Dutch soldier of fortune, and his wife Lady Betty Germain. Their porcelain is listed in an inventory drawn up on 14th September 1710, which includes the "cornice" of the State Bedroom was garnished with "Two little blue and white rollwagons, two china bottles, two little blue and gold rollwagons, two flowerpots with three feet and one little blue and white jarr". A similar kendi is illustrated in Soame Jenyns, Japanese Porcelains, pl. 53B and currently exhibited at the Fitzwilliam Museum, and Nihon Toji Taikei, vol. 20, Kakiemon, pl. 68.